In today's Washington Post, Robert J. Samuelson is at it again with a column called "The real Washington," in which he admonishes his readers for not realizing that we are a democracy and that the rich are paying for huge increases in aid to the poor, up from $126 billion in 1980 in real terms to $626 billion today, even while the suffering top income quintile are supposedly paying "70%" of federal taxes, poor things. He clearly decries this and thinks that aid to the poor along with his usual favorite target, Social Security, should if not be cut at least capped. The rich ae doing enough, more than enough, poor things, and here we are facing the "terrible threat of long term deficits," even though he only once manages to mention that "More promises were made than can be kept without raising taxes, which -- for the most part -- were also subject to bipartisan promises against increases." That this last remark is ridiculously lopsided should go without saying, but RJS is keen to maintain his position as a Very Serious Centrist. Dean Baker does a good job on pulling some of this mess apart, pointing out how much income has concentrated to the very top of the income distribution, with RJS emphasizing the top 20% rather than the top 1% or top 1/10% - http://www.cepr.net/index.php/blogs/beat-the-press/the-power-of-the-rich-is-measured-by -their-income-not-just-their-taxes . Anyway, even looking at RJS's numbers, they are not as dramatic as they look. While indeed the top quintile does pay 67.2% of federal taxes (not RJS's apparently rounded off 70%), the same top quintile earns 53.4% of income. So, yes, indeed, the federal tax code is mildly progressive. But in fact it used to be more so than it is now. The average federal tax rate for that top quintile has been lower since 2001 than it was for any years since the end of WW II except for 1982 and 1983. This moaning about the poor rich on taxes just looks silly. Furthermore, RJS's numbers overstate what has gone on regarding aid for the poor. Yes, indeed, it has indeed risen in real terms since 1980. But this increase is certainly overstated. The problem as almost always with RJS is that he ignores the outsize price increases in healthcare costs. His calculation of real payments seems to be deflated by the general CPI rather than the sector-specific ones. While from 1980 to 2010, the overall CPI rose 141%, the medical care one has risen 394%. The 1980 "real" number for Medicaid was about $60 billion, rising to $275 billion in 2011 out of the $621 billion for the poor. This seems like a massive increase, but when one corrects for the far greater increase in medical care costs than overall prices, the real increase in this is relatively modest, and this increase supposedly constitutes nearly half the overall increase. While we are at it, expenditures on TANF have not risen since welfare reform, and the number of enrollees has barely budged during the Great Recession. This part of the system for helping the poor has been nearly useless in the recent crisis. I am glad that food stamps (SNAP) have been way up, but Samuelson is just missing it when he tries to paint a picture of the rich being snagged badly by a bunch of overcovered poor people (along with ignoring the skewing to the rich of the tax code, not to mention the role of rising medical care costs in the spending patterns). But using Apple’s corporate accounting profit to arrive at its effective global rate of 9.8% is dubious because profit figures are different numbers versus the taxable income figures companies report to the Internal Revenue Service. A look at Apple’s filings with the Securities and Exchange Commission shows the more appropriate effective rate for Apple is likely more than double the 9.8% effective rate the Times reported. Apple already reports in its filings that its global effective rate for both 2011 and 2010 is 24%, and its effective U.S. federal rate is likely 20.1%. Moreover, its global effective rate for 2009 was 31.8%. Income before provision for income taxes was $34.2 billion while the tax provision was almost $8.3 billion. So the reported effective tax rate was over 24% not less than 10%. But the New York Times article noted that. So let’s go to the details as reported in Note 5 (Income Taxes), which notes that foreign pretax income was $24 billion with about $10 billion in reported US taxes. In other words, Apple did allocate 70% of its profits overseas. Foreign taxes were only $0.6 billion or 2.5% of its foreign pretax income. So why was its tax provision so high? The Federal portion was almost $6.9 billion due to almost $3 billion in deferred Federal taxes. The one thing that troubled me about the New York Times article was its claim that Apple avoided California taxes with its Nevada operations. This not only ran contrary to my understanding of how California tax law works but seems to be contradicted by the fact that the state tax provision was almost $0.8 billion or just under 8% of US pretax income. Two parables I guess – (a) understanding tax provisions isn’t always easy; and (b) don’t trust everything you read in the news especially if it is from Fox. Paul Ryan – Imposing Austerity in order to Avoid It? preempt austerity – we want to prevent that bitter kind of European austerity mode which is what we will have if we have a debt crisis. In other words, cut government spending now to avoid fiscal restraint later? Does he not know that we currently suffer from a lack of aggregate demand? We should be avoiding fiscal restraint now but considering long-term measures to reduce government deficits. Then again – the prime minister of the UK seems to be just as clueless as Congressman Ryan. How well is that working out? Regression-based decompositions have been used in the literature to try to identify the sources of wage gaps between men and women. These decompositions allow assessing how much of the gap is explained by observed gender differences in terms of individual productive characteristics, the remaining unexplained portion being ascribed to differences in unobserved characteristics and/or asymmetries in labour demand (see OECD, 2008a). Educational attainment and labour market experience typically explains only a small or even negligible portion of the gender wage gap. By contrast, labour market segmentation by occupation, type of contract, industry as well as firms and establishments typically explain a far larger share (see e.g. Altonji and Blank, 1999; Reilly and Wirjanto, 1999; Datta Gupta and Rothstein, 2005; Heinze and Wolf, 2006). However, evidence based on large-scale matched employer-employee data shows that even taking into account a fine disaggregation of occupations, industries and establishments, more than 50% of the wage gap remains unexplained (e.g. Bayard et al., 2003). More important, the gender distribution of jobs is itself the outcome of the equilibrium in the labour market. It provides therefore some indication of the channels through which a gender wage gap arises, but sheds no light on the ultimate causes of the gap. Frank Bruni addresses an issue in his New York Times column this morning that colleges and universities across the country are confronting: how to adapt to a world in which technological skills are in greater demand while hanging on to as much of their traditional mission as possible. Let’s put it starkly: higher ed needs to turn out more engineers and number crunchers, and it also needs to keep the fires (embers?) of critical consciousness burning. In my state of Washington, and maybe yours, this takes the form of increasing political pressure for universities to crank out “high demand” majors. This doesn’t refer to student demand—quite the opposite—but demand from the state’s largest and most politically connected employers. This includes STEM, of course, but also nursing. (Beleaguered and underpaid nurses abandon their profession en masse each year, and this is seen as a reason to train ever more of them.) But let’s talk about STEM. The pushback from defenders of the liberal arts is that education is not just about filling job slots, but about citizenship. The future of our country, nay the human race, depends on the cultivation of new generations who can see past the shiny surfaces to the deep questions of life, who are habituated to critique, whose perceptions are heightened by aesthetic acuity, etc. The call for STEM is really an effort to eviscerate society’s main sanctuary for critical consciousness. I think this is not an either/or question, but both/and. We need to think deeply and also be productive. Critical consciousness has to pay its way. To get from platitude to program, however, we have to consider what this means in practice. The obvious answer, and the one most of the attention is now focused on, is rebalancing. We need somewhat more STEM students and somewhat less in the other fields. To the extent that there is intellectual fat in a university’s catalog, it can be cut without harm to the liberal arts bone, so to speak. Hire a few more STEM PhD’s a few less of the other sort. Adjust and carry on. To my way of thinking, this approach evades the real issue. Engineers need to be critical thinkers, and critical thinkers need to be quantitative. Not each and every one (reject corner solutions! ), but lots of them. The democratic and transformative agenda of higher education has to pervade its economic agenda, and also, to a large extent, vice versa. This translates to increased traffic between the technical fields and the rest of the liberal arts. Engineering curricula should include industrial design to develop aesthetic appreciation for objects, along with historical and social approaches to technology to promote a critical, questioning spirit. (Engineers may also benefit personally in their future careers from studying labor history.) Meanwhile, philosophers should be learning game theory and historians more rigorous methods of quantitative data analysis. Ideally these would be bottom-up reforms, arising voluntary, even enthusiastically, from the faculty themselves. In practice, they will have to be elicited and nurtured, with strategic reallocation of funds and pressure on new hiring. Perhaps this is the easy part. To make it all work there also needs to be a fundamental change in the place of quantitative reasoning in our culture—in the schools, the media and daily life. The faculty and students who, in my dreams, will meld critical thinking and quantitative adeptness will not materialize spontaneously because a new course offering has been inserted into the catalog. Somehow we have to challenge the view that the ability to do math is confined to a small subset of our species, and that it’s OK for the rest to just opt out. Math classes have to do a lot more teaching and a lot less sorting; would we accept writing classes that allowed the great majority of students to come to terms with their inability to write by believing that they don’t have that special writing gene? But this is another rant for another day. Threats to income take the form of unemployment, wage loss and the loss of public benefits (the social wage). The policies attractive to this group are generally Keynesian: looser fiscal and monetary policy, measures to increase wages, and other interventions to prevent the economy from producing below its potential due to insufficient demand. Threats to wealth take the form of inflation and default. The policies these people are drawn to are what we usually call orthodox: tight monetary policy, restrictions on new borrowing (particularly by the public sector) and hostility to measures that would reduce the profitability seen as underlying asset and credit markets. The latter often comes dressed as labor market flexibility. Do these perspectives correspond to class interests? Yes and no. Clearly wealthier individuals are likely to be more concerned with wealth rather than income, and the reverse holds for those with little wealth. Nevertheless, it is not a strict mapping. There are high income individuals, for example in upper-level management positions, whose vulnerabilities arise far more from their future employment prospects than their portfolios. Similarly, many middle class retirees are highly dependent on the performance of their savings. In fact, this last example reminds us that there is a life cycle aspect to this divergence of interests as well as a class aspect, although the class influence is probably larger overall. How do these perspectives reveal themselves in economic policy discourse? We know about orthodoxy: it defends itself explicitly on the grounds of wealth effects. Inflation is always just around the corner, and any additional public borrowing puts the state on the slippery slope to insolvency. People must learn to live on less and to repay all their debts in full. The one interesting twist is that, recognizing that wealth preservation is not a widespread concern, those arguing for orthodoxy have tried to present inflation as primarily a threat to income: “the cruelest tax of all”. To do this, of course, they have to put aside the identity between incomes and expenditures (as adjusted by the current account), meaning that their appeal is based on sowing confusion. The fact that this particular falsehood cannot be put to rest by rational argument suggests that political economy plays a more powerful role in shaping discourse than economics. On the Keynesian side, much is made of the threat of demand shortfalls to profits and markets in claims on profits, and arguments are made that concerns regarding inflation and public insolvency are overblown. Perhaps the reason these arguments are only sporadically effective is that they do not address the very different weights wealth-holders place on income versus wealth threats, nor their perhaps justifiable concern (from their perspective) over tail risks. There is an emotive side to this dispute. Keynesians, by emphasizing the potential, even in the near term, for future wealth production, express optimism—a can-do attitude. Follow the right policies and we can advance together to a higher quality of life. The orthodox, who want to protect the accumulation of past wealth, express a sort of dourness. Adjust to the hard times, tighten your belt, and eventually we will get through this. In pointing to this, I am trying draw out the implications of the difference between the two perspectives in their orientation toward time. How well does this model capture the current debate in Europe and the US? ADDENDUM: I left out the confidence argument that is so important to the orthodox side. In public debate, they want to portray threats to wealth as equally threats to those without wealth. The way they do this is to argue that wealth-holders play a decisive role in investment, and investment is the key to protecting incomes. If threats to wealth can be removed, they say, the resulting peace of mind (confidence) will set off an investment boom. The essential role that the confidence trope plays in selling wealth protection to an income-preoccupied public explains why so much stress is placed on a claim that, by its nature, is almost incapable of reasoned support ex ante. The public debate over European austerity, so long overdue, is now breaking out. The baby steps of Hollande in France, the double dip in England, the difficulty in assembling an austerity coalition in the Netherlands and the first big anti-austerity demonstration in the East (Czech Republic) are all signs that fiscal orthodoxy is under siege. The backdrop, of course, is the descent of much of Europe into recession when the recovery from the financial crisis has barely begun. Given that officials have postponed a reckoning with the losses amassed by the banking system, this is a recipe for an even greater disaster. What stands out at this point is the extraordinary ignorance displayed by the defenders of austerity. Whether this is honest ignorance or the cynical kind is difficult to say, but in either case it should be shown for what it is. 1. Except for Greece, public sector deficits were modest and generally declining in the runup to 2008. In what sense did public spending provoke the collapse of the global financial sector in the fall of that year? 2. Fiscal deficits ballooned in response to the crisis; they were a symptom rather than a cause. 3. It was actually private debt that got us into this mess. Public debt has expanded to limit defaults and partially take up its role in sustaining spending. 4. Lack of spending is surely the core issue at present. Demand for goods and services is depressed, workers are out of work, and investment is anemic. Borrowing is how spending expands in advance of income. Either the private sector has to take on more debt or it’s the public sector’s job. But the private sector is justifiably deleveraging. Governments that can print money need to take up the slack. When income growth revives, public borrowing can recede. Not a single word of this quote is defensible. That includes “and” and “the” (both of them). 1. Again, the fiscal deficits are a symptom of the slump. We got drastically lower demand, and then we got deficits. Draghi might as well ask, if crutches are so good for getting around, why don’t we see more people on crutches in the Olympics? 2. The austerians are demanding that deficits shrink. This will decrease demand and intensify the slump. 3. The deficits are doing less than they should to stimulate demand because a portion of government spending, especially in places like Ireland and Spain, is going to bail out the financial sector. With no EU-level plan to either bail out or resolve finance, it is left to individual countries to do this. Since Draghi is not doing the job a real central banker should be doing, at least he can stop criticizing those who are trying to do some of it for him. Just as irrationally, Draghi goes on to say that growth can come only from structural reform that makes economies more efficient. Huh? That’s about the growth of supply, not demand. True, if an individual country gains in efficiency relative to the others, and if its exchange rate doesn’t adjust (perhaps because it has given up its own currency), then, yes, it can boost its demand through an increase in net exports. But this is a zero-sum game overall. Rebalancing is important for averting the structural forces that create unsustainable debts, but that has little to do with aggregate demand across the system. So what I propose is this: expose the absurdities of austerian arguments every day. Don’t let any of it pass. Let’s get to the point where denying basic economics is like denying climate change, where ordinary people can see that the controversy is an expression of who is paid to say what, not the underlying science. Mitt Romney apparently agrees with President Obama on extending the 3.4% interest rate on student loans, which puts both of them at odds with Republicans in Congress. Of course, we will have to wait and see if Mr. Romney shows any real leadership in helping the President overcome the opposition in Congress from his own party. I would humbly submit that this is only a very small step in restoring the recent damage to our education system. 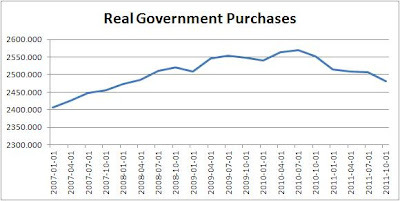 Our chart shows the decline in real government spending using data from this source (see Table 3.15.6. Real Government Consumption Expenditures and Gross Investment by Function). Phil Oliff and Michael Leachman documented how state and local government support of elementary and high school education has been declining since the recession. Diane Epstein discussed what the Ryan budget would mean to education spending a month ago. Pell Grants, which already have seen declining values relative to college costs, are slated to be drastically reduced. Head Start funding will also be reduced. Of course, most of what public commitment to education comes from state and local governments, but the Federal government can reverse these recent cuts with a greater commitment to Federal revenue sharing. And the bonus would be that we might avoid doing further damage to the economic recovery ala austerity. In other words – if Mr. Romney wants to really lead, then he will insist that we reject this Ryan budget. Prime Minister David Cameron said the figures were "very, very disappointing". "I don't seek to excuse them, I don't seek to try to explain them away," he said at Prime Minister's Questions. "There is no complacency at all in this government in dealing with what is a very tough situation, which frankly has just got tougher." He said it was "painstaking, difficult" work, but the government would stick with its plans and do "everything we can" to generate growth. Does he mean sticking to austerity, which likely caused the economic downturn? My emeritus colleague, John Perkins, asks a deep question about proposed justifications for a precautionary principle: would they, in early 2003, have provided a basis for the US invasion of Iraq despite, or even because of, uncertainty about the existence of Iraqi weapons of mass destruction? The stylized decision situation is this: the US has suspicions that horrible chemical or biological weapons are being stockpiled in Iraq, but there is no firm evidence. Indeed, the likelihood of WMD’s is small, but the negative consequences if they actually exist are severe. Suppose further that decision-makers are honest (this is a purely hypothetical test) and want to act rationally so as to minimize the harm of either launching or not launching military action. In other words, this is a make-believe scenario, but one that nevertheless captures an important aspect of the meaning of precaution: if being precautionary in such a situation makes you more likely to want to invade Iraq, you have a problem. So is there a version of the precautionary principle that passes this test? Intergenerational equity arguments (irreversibilities justify low or zero discount rates) are at best a wash, since the costs of under- or overestimating the likelihood of WMD’s have approximately the same time profile. (The main problem with intergenerational equity is that, while it is a fine concept, it has little relevance to most situations that might require precaution; precaution is about coping with uncertainty, not valuing immediacy versus delay.) Fat tail aversion à la Weitzman would seem to fail the test, since it would place greater value on insuring against catastrophic WMD risk. According to this principle, it’s better to accept the certain devil we do know (invasion) than run the risk of the less likely but even worse devil we don’t. You could argue for a different type of precaution: don’t mess with nature. This would avoid WMD dilemmas by defining precaution as being about only environmental questions, but at the cost of being either grossly impractical or incoherent. Example: agriculture, even the most organic kind, is absolutely messing with nature, as are many of the other essential practices of the human race. Green-is-good is an attitude, not a rational basis for a decision principle. I think my version of precaution does pass the test. To recap (OK, not “re” for most readers), I propose that metadata—the history of how we have learned in the past—is relevant to evaluating our ignorance in the present. If a company had a record of underperforming its earnings target quarter after quarter, you would take this into account even if you had no current information regarding the likelihood of its meeting its next target. Similarly, what distinguishes the emergence of ecological understanding over the past century or so is that we systematically discover that species, including our own, are more interdependent than we thought, and more sensitive to alterations in their natural environment at lower exposure thresholds. It is rational to expect that the larger part of our current uncertainty regarding environmental impacts will resolve itself in similar ways in the future; hence precaution. Here is why I think it passes Perkins’ test. On the one hand, there has been a long series of manipulated intelligence reports used to justify policies favored by those in power in Washington; foreign threats usually turn out to be less threatening than initially reported. (Intelligence pertaining to Japan pre-1941 might be an exception, maybe.) On the other, invasions of foreign countries have typically turned out worse than expected: more resistance, more repression in response to resistance, more cruelty, more overall economic and human cost. On both counts the metadata should be incorporated into the decision process, and both counsel precaution as I understand it. My golden rule of precaution: make the decision today that, based on everything you know up to this point, you will be most likely to have wished you had made in the future, when you will have more information. Assess the likely bias of your ignorance. I’ve just finished watching Jamie Galbraith’s INET talk on inequality (thanks, Yves) and was struck by his geographic discussion toward the end. Most of the increase in US inequality in the last decade or two has been concentrated in just a handful of counties, particularly Manhattan, San Francisco, King (Seattle) and a few others. Let’s suppose the explosion of high incomes in the financial sector accounts for about a fourth of the increased share claimed by the top 1%. (Does anyone out there have a real number for this?) Given geographic concentration, we should look also at the services consumed by the financial elite. A rough law has it that the earnings of a service provider are proportional to the income of his or her clients. A dog walker to the rich makes more than a preschool teacher in a low-income neighborhood. We can therefore propose a sort of inequality multiplier associated with the initial bounty bestowed on those in finance: much more prosperous decorators, physicians, restauranteurs, etc. These spillovers would be concentrated in close geographic proximity to the location of financial centers. The point is that there are both direct and indirect effects of finance’s grip on profits, much of which would not be captured by existing empirical methods. Pear, Robert. 2012. "Social Security’s Financial Health Worsens." New York Times (24 April): p. A 13. "The Obama administration reported a significant deterioration in the financial outlook for Social Security on Monday, while stating that the financial condition of Medicare was stable but still unsustainable." "The Social Security trust fund will be exhausted in 2033, three years sooner than projected last year, the administration said." Let's see if we can get this straight. For 40 years wages have gotten hammered by the "job creators". People become increasingly reliant on Social Security, but the system is in trouble because people do not earn enough to get enough taxes taken away to cover social security. The obvious answer is to destroy social security. First, read these two articles, one from the Harvard School of Journalism, the other from the New York Times, back to back. A match made in heaven, no? Now that you’ve done your homework, here is my take. For the past thirty years we have seen repeated campaigns to eviscerate Social Security—to privatize it, siphon off its finances, drain it of its essential social insurance character. These have failed, not because of the brilliance or commitment of its defenders, but simply because it fulfills a vital social function and is wildly popular. Even those who, in their heart of hearts, want to crush it to bits, claim to be in favor of “saving” it. So what’s the strategy of the anti-SS minions? Economists, always intent on making their work into a science, like to transform their ideas into a "scientific" law. Accordingly, the Fascist Italian senator, Vilfredo Pareto is credited with discovering Pareto's Law, which explains why inequality is a natural outcome. Pareto suggested that 20% of causes create 80% of effects. He argued that this law explains why 20% of the Italian population owned 80% of the wealth. Sadly, the U.S. experience calls Pareto's data into question, but then, those lazy Southern Europeans wallow in socialism. "In all periods of the history of our country we find facts similar to the practices we have just pointed out, permitting certain persons to use stratagems to appropriate to themselves the goods of others; hence we can assert, as a uniformity revealed by history, that the efforts of men are utilized in two different ways: they are directed to the production or transformation of economic goods, or else to appropriation of goods produced by others. War, especially in ancient times, has enabled a strong nation to appropriate the goods of a weak one; within a given nation, it is by means of laws and, from time to time, revolutions, that the strong still despoil the weak." Pareto, Wilfredo. 1906. Manual of Political Economy, Ann Schweir, tr. (New York: Augustus M. Kelley, 1971): p. 341. The final phrase about the strong despoiling the weak offers an excellent insight into the way that capitalist countries, led by the United States have been repealing Pareto's first law. The good news is that the trustees believe the Affordable Care Act strengthened Medicare — and project, as they did last year, that the program won’t exhaust its hospital insurance trust fund until 2024. The Board assumes that the various cost-reduction measures — the most important of which are the reductions in the payment rate updates for most categories of Medicare providers by the growth in economy- wide multifactor productivity—will occur as the Affordable Care Act requires. The Trustees believe that this outcome, while plausible, will depend on the achievement of unprecedented improvements in health care provider productivity. And we have heard that Romney as President will repeal ObamaRomneyCare which will worsen the Medicare situation. Are you thoroughly confused on Romney’s position now? This reminds me of, you know, going to a surgeon, right? If I’ve got a terrible cancer or something to be operated on, when I had to be operated on for prostate cancer, I didn’t go to the nicest doctor, I went to the best doctor. The guy could have a great personality and tell jokes [and he] put the knife in the wrong way. On the other hand, if he’s a great doctor, that’s my guy. While a doctor does need to know how to ably control the knife, he also has to know how to diagnosis the ailment as well as ascertain the right procedure. And let’s just hope that the next time Mr. Giuliani has to go under the knife that his surgeon does not change his mind mid-operation. On April 20-21 at the New School for Social Research there was a symposium held in honor of Duncan K. Foley at which he was presented a festschrift. It was organized by his now retired colleague, Lance Taylor, along with former student and coauthor Armon Rezai, and his coauthor on Growth and Distribution, Tom Michl. Duncan is now part-time at NSSR and about to turn 70. The symposium was a fascinating collection of people from his past discussing many ideas that Duncan has worked on over his career, from his orthodox work on general equilibrium theory, through his work on money in Marxian theory, his work on growth and distribution, econophysics, history of thought, financial markets, public goods, global climate, and other matters. He made a long personal commentary on his career at the end, and on Friday evening letters of admiration were read and many colleagues and students spoke about Duncan's work and influence on them most praisingly. I shall list who presented and then discuss some ideas of particular interest. The first session was on him personally. After the NSSR president presented him the festschrift, Michael Piore reminisced about their time at MIT together after Duncan finished his PhD in two years at Yale. Then I spoke about his role in the development of complexity economics. The second was on growth and distribution, with papers by Amitava Dutt, the French Marxist Gerard Dumenil, and Tom Michl. An idea pushed by both Dumenil and Michl is that a more useful short-run equilibrium condition for a macroeconomy is the rate of capacity utilization, arguing that unemployment rates are poorly measured, and that the natural rate of unemployment is an empty concept useless as an equilibrating condition. Then Duncan's major professor, Herbert Scarf, still very on top of things at 81, chaired a session on Decentralized, Dispersed Exhange, with his student now a philosopher, A.J. Julius proposing a catallactic adjustment to GE process, Graciela Chichilnisky discussing her role in writing into the Kyoto Protocol the cap and trade article, and arguing in favor of her idea of a green golden rule in which the present does not exploit the future and that the future does not exploit the present. She identified this as the meaning of sustainability. Then there were two papers on econophysics, Joe McCauley speaking on financial markets and Victor Yakovenko speaking on income and wealth distribution dynamics and patterns. The final session of Friday was on Value, Distribution, and Capital, chaired by his colleague, Ed Nell. Simon Mohun argued that the labor theory of value can be used to analyze shares of income between different categories of labor, counting supervisory workers wages as returns to capital. Ed Wolff discussed downsizing between 1967 and 1997, reporting that firms downsizing experienced falling profits and share prices, and that downsizing was linked to de-unionization. Anwar Shaikh dscussed how different categories of capital are treated in US national and income accounts, and Duncan's student from Stanford, Tracy Mott followed up on the themes of the earlier talks. On Saturday morning, K. Vela Velupillai spoke on Duncan's PhD thesis and how he had independently discovered a method of studying shadow prices for public goods due to Negishi. Peter Skott spoke on how accounting for positional concernsn by people increases the return to acting to slow global warming. The final session was the most stimulating. Perry Mehrling spoke about the hierarchy of money and how the current global system of credit and debt is operating. He posits that there is now an effective global lender of last resort, the C5. This group is the key group of the five most important central banks, the Fed, the ECB, the Bank of Japan, the Bank of England, and the Swiss central bank. Curious that the Bank of China is not part of this group, despite the increasing importance of the Chinese economy in the world. Phil Mirowski spoke on his ideas of markets as markomata or information processing mechanisms and argued a Minsky view that the financial markets inevitably destabilize themselves. Finally, Rajiv Sethi spoke on how algorithmic trading is destabilizing world financial markets. There were some heated discussions in this session, all very stimulating. What's the Economy For, Anyway? : Why it's time to stop chasing growth and start pursuing happiness, by John de Graaf and David K. Batker, 2011. Bloomsbury Press. Here's something Sandwichman didn't know: "Hoover and Roosevelt (and their predecessors) had one thing in common. None entered office with a model or theory of how a national economy works." Others, like Brad DeLong and Mark Thoma, have gone after Acemoglu and Robinson for their “argument” that, because Hitler used massive stimulus to extricate Germany from the Depression, there is nothing intrinsically progressive about Keynesianism. I want to make a different point. Hitler and his minions were evil and did unspeakably awful things on a massive scale. Are we clear? Now, let’s talk about the complications of real history. The Nazis did not descend on Germany sprouting horns and hooves. True, reasonable people knew from the start they were very bad news, but there were aspects of the Nazi program that were attractive as well. High on the list was a realistic program to restore economic growth, including large-scale stimulus, capital controls and renunciation of the Versailles debt. Remember that, before Hitler, there was Brüning. It should also be mentioned that the Nazis had an exceptionally progressive environmental and public health agenda, including restrictions on smoking, pesticide-free agriculture, workplace safety and improvements in diet. If you doubt this, read The Nazi War on Cancer, an extraordinary, mind-bending book by Robert Proctor. Again, none of this justifies a regime that committed such colossal crimes—but that’s not the issue. Hitler was not an incarnation of pure evil, just an exceptionally destructive but in some ways normal political leader. He rose to power by addressing real needs of real people. You don’t prove that vegetarianism or organic agricultural are reactionary by showing that they were sponsored by the Third Reich, and the same goes for Keynesian stimulus. Repeat: it’s about seeing Hitler not as a slogan or comic book villain, but as a real life historical figure with layers of complexity. And once again, since I will probably be misunderstood: yes, the racism, militarism, totalitarianism and genocide were unspeakably horrible. Maybe this is a hot topic of conversation in other venues, but has anyone here noticed that the imbalances crisis of the Eurozone is exactly what the structural/cohesion funds were supposed to forestall? Billions spent, and what to show? I run each morning on an EU-funded trail, for which I am supremely thankful, but I would gladly forego it to somehow, magically rescue the good people of Europe from the maw of austerity. Was it destined to be thus? That wasn’t really Jörg Asmussen of the ECB on day 1. It was actually a standup comedian who had perfectly mastered central bankspeak in order to exaggerate and make fun of it. Funny how I was the only one in the audience who seemed to know what was going on. Axel Leijonhufvud pulled something on day 1 I’ve never seen before at an academic conference: he flashed the title slide from his PowerPoint, then said “This is not my paper.” After this, another title slide and another disclaimer. I wish he had gone on in this mode. Ages ago, when I was a freshman in college, I went to a poetry reading by Charles Olsen. He began by opening a large briefcase, saying, “There’s a poem here I would like to read to you.” Then he spent a few minutes leafing through it—no luck. So he pulled out a different poem. “This is not the one I want, but give me a few minutes for it anyway.” Then back to the briefcase for several more futile minutes. Then another wrong poem. Then more briefcase. Of course, he never found what he was looking for. I’ve always wondered whether this was chaos or schtick. Anyway, AL wants bankers to be paid in equity, and he wants liability to be limited not at zero but at some negative value, whatever it takes to evoke behavior that is acceptably prudent. Norbert Walter took one look at the hostile crowd massed under the (invisible) banner of Keynes and decided not to engage in any discussion. Wolfgang Munchau said something I hadn’t thought of that sounds right. I asked him about my pet theory regarding why some of the Landesbanken got into big trouble, despite their historic focus on financing the Mittelstand rather than newfangled financial instruments, which is pressure from Brussels. They were facing a lot of heat and had to demonstrate a market rate of return (i.e. no subsidies), and the poor trusting souls managing their portfolios just bought a bunch of toxic AAA’s with no questions asked. Yes, said Wolfgang, this is part of the story, but the bigger part is that, with the ballooning of the German current account surplus in the early and middle parts of the decade, the Landesbanken found themselves with an excess of deposits. After they had made all the reasonable loans they could find to their Mittelstand borrowers, they had gobs more to dispose of. Then the stories converge: poor trusting souls, etc. Katharina Pistor gave what looked like an interesting presentation on financial markets based on a hierarchical vision of their structure. Looked, alas, because the acoustics were terrible, and she has a quiet voice, so I could only guess at her content. Her talk is up in video; you should check it out. John Kay’s talk was memorable. He is of the opinion that the hyperprofitability of finance in the runup to the crisis (and since, I would imagine) is illusory. There were no such superprofits. It was/is accounting fraud on a cosmic scale. What do readers think of this? I garbled a question from the floor about the democratic deficit in Europe–-didn’t ask it the way I wanted—but it didn’t matter. Really, all I had to do was use the two d words. They had been missing from the vocabulary and it was starting to rankle. On the other hand, I had the pleasure of hearing a speaker refer to a cost-benefit study I had done about a decade ago on an entirely unrelated topic (child labor), a truly odd coincidence. Armin Falk gave the sort of talk that makes me schizophrenic. He summarized a lot of studies that show that fairness in labor relations is a win-win. Yes, but how to explain unfairness? Are lots of firms just making mistakes, or do they know something that academic economists don’t? Jim Heckman gave his now well-known plea for big investments in early childhood education. Elsewhere, I’ve written that the criterion of equal opportunity requires specifying a moment of equality. In the language of the footrace metaphor, if the criterion of fairness is a fair starting point for everyone, you have to designate that point. I think for Heckman it may be around age three, on pragmatic if not philosophical grounds. (The later you make it, the more individual choice you have to override.) Me, I’m in favor of fun runs with just enough prizes to get people to stretch out a little. Meanwhile, Heckman praised Schooling in Capitalist America, whose coauthor, Herb Gintis, was in attendance. For JH, this is a book about the value of noncognitive skills, which everyone needs to acquire. 1. The term “microfoundations” is fundamentally misleading. What we really have are aggregate behavioral functions. Economists feel more comfortable if the functions that predict collective behavior mirror those that they are familiar with at the individual level, but since collective behavior is not derived from individual behavior, this preference has no theoretical basis. 2. It is possible that optimization assumptions that are so flawed at the individual level may work better at the collective level, in the sense of better explaining the data. I don’t think that’s the case on my planet, but I grant that the failings of this behavioral model at the individual level are not in themselves dispositive. 3. Since we are not deriving aggregate behavior from individual behavior, we are free to play with models that might not be applicable to individuals. Thus we can consider models of the formation, competition and dissolution of norms and conventions, or herd behavior at the level of the herd. 4. While a full specification of the state of the world at time 0 would enable us to predict, perhaps with error, behavior in time 1, no one is trying to do this. Instead, we have radically incomplete specifications with models that are essentially heuristic, somewhat better or worse at explanation and prediction under particular circumstances. Thus the goal of forecasting has to be scaled back. What we can do if we are really at the top of our game is generate forecasts that are conditional on a possibly large number of future circumstances which themselves cannot be forecasted. We don’t know whether a major war or natural disaster will disrupt the economy over the coming months, or whether the “mood of the market” will shift substantially, or even the full extent of exposure of the financial system to the systemic risks implicit in their various derivative instruments. We can’t put percentages on them either. All we can do, at best, is arbitrarily identify a large set of assumptions and forecast conditionally on them. (And one catch-all assumption is that none of the consequential unknown unknowns will materialize.) For this reason, forecasting may be a false goal. A more serviceable one would be to identify processes with known dynamics in as close to real time as possible. Example: I can’t forecast the effect of “fiscal consolidation” (austerity) on European growth rates, but I can possibly track the process by which falling credit and output demand on the part of the state is generating reduced income and monetary growth in the present. A lot else is going on that will affect how Europe progresses, but do I need to construct forecasts that are sensitive to it? The G.I. Bill paid a different kind of bonus. The doors of colleges and universities opened to people for whom higher education would have been out of reach. Their skills proved invaluable during the postwar economic boom. A second unintended bonus flowed from the G.I. Bill. To accommodate the massive inflow of students, colleges and universities built infrastructure to expand their capacity to handle so many students. After the wave of veteran enrollments dissipated, colleges and universities had to choose between letting this infrastructure sit idle or enrolling more students. Judging from my experience teaching during the Vietnam War, returning these veterans must have made an important contribution to the teaching environment. Although many soldiers were unable to put their lives together after the trauma of war, some came back, totally focused on making something of themselves. Some of their maturity and dedication rubbed off onto the younger cohort of students. A less dramatic burst of government spending into education came from the National Defense Education Act of 1958, which was a response to the USSR's launch of Sputnik, the previous year. This time, much of the money was narrowly focused on improving the quality of science and language education. I have personally experienced the rise and fall of higher education in the United States. I enrolled at the University of Michigan in 1957, a few months before Sputnik was launched then, in 1965, I enrolled in graduate school at the University of California, Berkeley. This was a time of great optimism about the future. I did not realize that very hard times for higher education were about to begin. As the student population swelled during the 1960's, the youth culture developed as a result of demographic changes, the Vietnam War and skepticism about consumptionism clashed with a different kind of pressure: a sagging rate of profit, following decades of unparalleled prosperity. Under these conditions, the goal became to reverse the gains from the G.I. Bill. Rather than including people in education, who might otherwise threaten the status quo, reining in the University system seemed urgent. In the fall of 1970, Governor Reagan's aide Roger Freeman, who later served as President Nixon's educational policy advisor, while he was working at the time for California Governor Ronald Reagan's reelection campaign, commented on Reagan's education policy: "We are in danger of producing an educated proletariat. That's dynamite! We have to be selective about who we allow to through higher education. If not, we will have a large number of highly trained and unemployed people." In 1971, just before he was nominated for the Supreme Court, Lewis Powell, a corporate lawyer wrote a now-famous memo, "Attack of American Free Enterprise System" for the Chamber of Commerce. 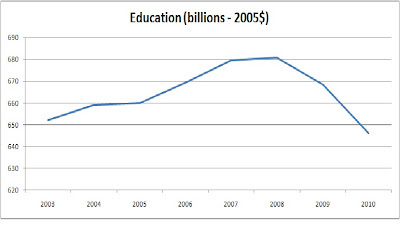 Higher education appeared to be at the heart of this attack on free enterprise. He described how the Chamber could gain more control over the educational system. Although the memo was superficial at best, it sparked great interest among the elites, influencing or inspiring the creation of the Heritage Foundation, the Manhattan Institute, the Cato Institute, Citizens for a Sound Economy, Accuracy in Academe, and other powerful organizations. 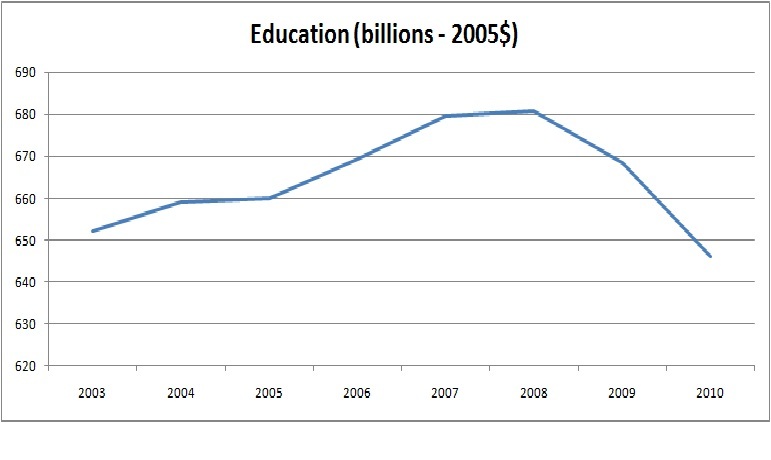 The response to the falling rate of profit also played a role in changing education. Tax reduction had the attraction of partially restoring profits, but it also had an important effect on education. Growing budget deficits would ramp up pressure to privatize what had been previously public responsibilities. By largely defunding education, universities became increasingly dependent on corporate money. Administrators became cautious about allowing expression of ideas that might seem upsetting to business. These factors took an enormous toll on higher education. Tuition began a rapid ascent. Student debt accumulated. University funds were concentrated on programs that cater to business needs, such as biotechnology and engineering, and, naturally, business schools. Visiting Berkeley, I am always struck by the lavish libraries for biotechnology and business, while the other disciplinary libraries were unchanged. The one exception that stood out was public health, which was torn down to make way for a new biotech building and then moved to the basement of an old administrative building. The educational assembly-line that Mario Savio described during the Free Speech Movement at Berkeley has changed, but not for the better. At the same time, leaders in business and politics insist that education is an essential element to a successful economy. Nonetheless, education becomes increasingly unaffordable, at the same time that the quality. Each cohort of students seems less prepared than the last. All the while, graduate programs are educating students for work that they love, even though top prospect are slim. In today's Washington Post, fresh from having made a fool of himself recently over Social Security, the indefatibable Robert J. Samuelson is at it again. This time his target is "The economy of happiness," which he thinks should be left to novelists and philosophers rather than psychologists and economists, who obviously do not know a thing about it. If this is not done, then governments trying to follow the mandate of the Declaration of Independence to support the pursuit of happiness (among which is the Tory-led government in UK) are "at best utopian; at worst...silly and oppressive." Well. RJS notes the research of Richard Easterlin, dating to 1974, on the paradox named for him that shows that while at any given point in time in a society poorer people tend to be unhappier than middle and upper income people, rising incomes over time in a society do not noticeably raise the level of happiness, thus suggesting that it is very much a relative matter. He then contrasts this with the recently much-publicized work of Wolfers and Stevenson that supposedly shows that rising incomes do help happiness. It is true that unexpected increases in income may help happiness, although China's happiness levels have been declining with its rising income, and it is definitely true that people become less happy when their incomes unexpectedly decline, as happened in the former communist Eastern European countries after 1989. But their main evidence is cross-country comparisons. So, yes, higher income countries tend to have higher happiness levels than lower income countries. However, this is easily explained by the Easterlin Paradox applied internationally. Poorer countries tend to be weaker in political and military terms than higher income ones, often having histories of having been ruled or dominated by some of those higher income countries. With TV and internet they can see the lifestyles of those in the higher income countries and can thus feel the negative effect of their relative poverty. This does not disprove Easterlin at all. As for what is going on at the top, RJS gets all in a snit about the 10 countries ahead of the US in reported happiness: Denmark, Finland, Norway, Netherlands, Canada, Switzerland, Sweden, New Zealand, Australia, and Ireland. He argues that these do not matter because they do not have large populations and also that they are relatively homogeneous ethnically. He then notes that UK, France, and Germany are all behind the US and sneers at those who think the US should somehow emulate Europe "where the happiness movement is strongest." Well, one barely knows where to begin with this dipsy-doodle. Of the 10 countries reportedly happier than the US, 7 of them are European. Oooops! Also, several of these are not nearly as ethnically homogeneous as he seems to imply. Canada has long had conflicts between its Anglophone and Francophone populations, not to mention native groups. Several of the others have large immigrant populations with increasing conflicts related to that, notably Switzerland, Denmark, and Sweden. He notes accurately that high unemployment tends to reduce happiness, but are policies designed to increase employment likely to be "silly" or "oppressive"? As it is, one should consider just what sort of policies are being proposed to increase happiness in the US. Happiness studies note the importance of time with family and friends to happiness, along with the obvious matter of greater income equality, and better health. So, laws and rules making it easier for people to have flexible work hours, for women (and fathers) spend time with their children or have decent child care, as well as efforts to reduce inequality, not to mention making quality healthcare more affordable and widely available should help happiness. These are indeed things one finds in most of those countries with reported higher happiness than the US, and many efforts have been made to move on these matters in the US. Are they really so obviously utopian or silly or oppressive? And when will Robert J. Samuelson start writing columns that are not just crawling with reptilian nonsense? Five years ago today was the massacre at Virginia Tech in which 32 students and faculty were shot dead by a maniac carrying two semi-automatics he had recently purchased. While there was a minor improvement in the national data base on people with mental illness for use in checking when selling guns, in most places the pressure by the unstoppable National Rifle Association has been to further loosen laws limiting access to guns in any way, shape, or form. So, in Virginia, where there is pressure to allow guns on campuses now, the legislature this year removed a restriction on buying guns that limited an individual to not more than one per 30 days. Priot to the enactment of that restriction in the 1990s, it had been shown that 40% of the homicides committed in New York City had been purchased in Virginia. I see absolutely no reason why any responsible gun owner in VA needs to buy more than one per 30 days, but here we are setting ourselves up to supply the murderers of northeastern cities once again. Then we have the proliferation of Stand Your Ground laws throughout the US, with reportedly half the states having them. This movement only got going two years before the VA Tech massacre by showing up in Florida, where we have now witnessed the spectacle of George Zimmerman at least initially getting off the hook for killing with his gun the unarmed Trayvon Martin after stalking him. Zimmerman may yet be punished for this, but the evidence is in. The rate of "justifiable homicides" has doubled in states that have passed this sort of unneeded legislation pushed quietly by the NRA. After all, self-defense has been on the books for centuries in common law countries as a legitimate reason for engaging in violence against somebody. These laws just protect criminal murderers claiming to be standing their ground. While researchers such as John Lott throw fluff in peoples' eyes about the impact of making more and more guns available, some rather clear facts should be kept in mind, despite the craven kowtowing by Dem politicians (not to mention the utterly slavish Repubs) to this generally unpopular, but powerful, lobby, the NRA. The US is #1 in the world in firearms per capita. It is also #1 in gun suicides per capita. While it is merely 13th in the world in gun homicides per capita, those ahead of it are all much poorer countries, mostly in Latin America, with huge amounts of drug gang violence. The only other nation to have a "right to bear arms" like that of the US is Honduras, one of those ahead of the US on this gun homicide per capita list, and reputed like Virginia to be a major supplier of guns to its neighbors, two of which are also ahead of the US in gun homicides per capita: Guatemala and El Salvador. It is time that the American people stood up to this dictatorial special interest group that has gotten completely out of control and also gone against its own past more reasonable support for reasonable gun control. They must be stopped before they start pushing mandates for three year olds to take guns to day care centers. Geither notes that Romney’s claim has been thoroughly debunked but I thought we’d add to the excellent analysis of how absurd his claim is by showing the employment to population ratio by gender since January 2007. 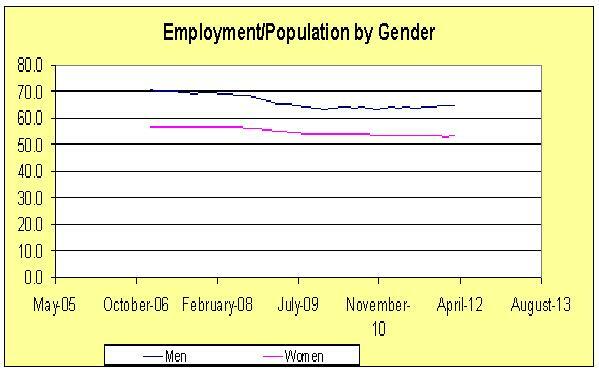 Even before the official start date of the recession that began in December 2007, the employment to population ratio both for men and for women began to slip. By January 2009 the ratio for men had plummeted from 70.3% to 66.2% while the ratio for women had declined from 56.8% to 55.3%. The bottom for the male ratio occurred by December 2009 when it hit 63.3%. This ratio has crawled back to 64.4%, which is still a far cry from where we would like to see it. 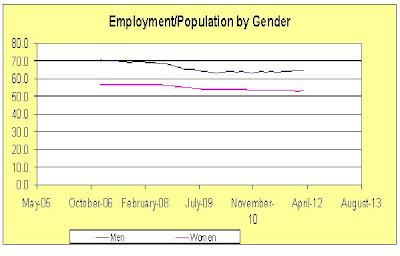 The bottom for the female ratio did not occur until January 2012 when it hit 52.9%. It is now only 53.1%. One of the reasons why this ratio continued to fall is the incredibly unwise cuts in state and local government employment. More Federal revenue sharing, which has been advocated by Democrats, could have offset this Herbert Hoover style fiscal policy, but it seems the Republicans and Mr. Romney are advocating even more government spending cuts. Go figure! In the 4/13/12 Washington Post, David Ignatius has a story, "Kissinger's lesson for a new Iran." Apparently Ignatius is teaching a course this semester at Harvard and as a result was invited to a grand reconciliation between Harvard and Henry Kissinger, with the 88-year old latter giving a long speech about diplomatic history with nods at current events. So, although he used to bloviate about the 1648 Treaty of Westphalia, this speech focused on the 1815 Congress of Vienna and how supposedly wonderfully Metternich and Castlereagh reordered post-Napoleonic Europe into the stable and peaceful (if reactionary) "Concert of Europe" that would last for a century despite the occasional hiccup like the Crimean and Franco-Prussian Wars. The story was about integrating an "upstart" nation (France then) that is more a "cause than a nation" into the broader context of the international family of nations and balance of power that was initially set up in 1648. So, the current story is that Iran has been and continues to be like Napoleonic France, more a cause than a nation, and that what is needed for it is to overcome that and become a regular country in the now ongoing nuclear negotiations. I do not know if this will happen, but for once I agree with the old rascal. One sign it might happen is that for the first time the mainsteam US media is finally reporting Khamenei's fatwa against nuclear weapons, although most of them are reporting his most recent reaffirmations of this, not noting that he issued it many years ago and also failing to notice its deeply religious foundation. However, all we can do is hope that indeed an outcome will be achieved that will bring about a major improvement of the prospects for world peace (not to mention a lowering of oil prices) and maybe even a longer process of finally integrating Iran into the world community of nations. Maybe the serious people there are finally beginning to accept that their revolution of 33 years ago is not bringing about the reappearance of the Hidden Imam (the Shi'a version of the Second Coming), and that they must accommodate and come to terms with the rest of the world. So, while today is my 64th birthday, yesterday I and two co-conspirators had a skype conversation definitely deciding on starting a new journal to be called the Review of Behavioral Economics (ROBE), which has been under consideration for several months now. I shall be the Founding Editor. One of the co-conspirators is Zac Rolnick, who runs nowpublishers and will be the Publisher and who as manager of journals at the old Kluwer oversaw the starting of more journals in economics than any other publisher (some include Journal of Risk and Uncertainty and Experimental Economics). The other co-conspirator is Morris Altman who will be Coeditor, and who was long time Editor of the Journal of Socio-Economics. BTW, for anybody who does not know, I edited the Journal of Economic Behavior and Organization (JEBO) for nearly a decade. I could say many things, but the one that I shall say for now here is that a lot of people told me that under my editorship JEBO managed to be the only economics journal that pulled off the balancing act of being both "heterodox but respected." I hope that we shall be able to pull something like that off with ROBE. So I’m driving around today and I turn on the news, only to hear Gov. Romney state that 92.3% of the jobs lost over President Obama’s tenure have been lost by women. That strikes me as a weird and unreliable statistic, possibly correct but certainly cherry-picked. In other words, the ax falls predominantly on women when governments shrink, a trend that many Republicans (including Mr. Romney) have endorsed. The main way to stem these state and local job losses is to give more federal money to the states, a policy that Democrats (including the president) have been supporting and Republicans haven’t. We reached out to Gary Steinberg, spokesman for the BLS, for his take on the claim. He pointed out that women’s job losses are high for that period of time because millions of men had already lost their jobs. Women were next. "Between January 2009 and March 2012 men lost 57,000 jobs, while women lost 683,000 jobs. This is the reverse of the recession period of December 2007-June 2009 (with an overlap of six months) which saw men lose 5,355,000 jobs and women lose 2,124,000 jobs," Steinberg told us in an email. So timing was important. And if you count all those jobs lost beginning in 2007, women account for just 39.7 percent of the total. Gary Burtless, a labor market expert with the Brookings Institution, explained the gender disparity. "I think males were disproportionately hurt by employment losses in manufacturing and especially construction, which is particularly male-dominated. A lot of job losses in those two industries had already occurred before Obama took office," he said. "Industries where women are more likely to be employed – education, health, the government – fared better in terms of job loss. In fact, health and education employment continued to grow in the recession and in the subsequent recovery. Government employment only began to fall after the private economy (and private employment) began growing again." Betsey Stevenson, a business and public policy professor at Princeton University, also pointed out that "in every recession men’s job loss occurs first and most, with unemployment rates for men being more cyclical than those of women’s." She added that many of women's job losses have been government jobs -- teachers and civil servants -- which have been slower to come back because they require greater government spending. "I hope you will agree that this rating was inappropriate and that the piece does not reflect the journalistic standards to which your organization intends to hold itself. Please retract the piece and issue a correction as soon as possible," Romney adviser Lanhee Chen wrote in a letter obtained by The Huffington Post. Chen wrote to PolitiFact that their "analysis in this instance was so inadequate that the piece ended up being little more than Obama for Americaspin." I guess when their mendacity gets noted – the next step for Team Romney is to bully the press. After all - truth has such a liberal bias. Now this is an economics blog, so for National Poetry Month I will append another of my favorite poems, large portions of which I have excerpted in an article I wrote for JEI lo these many years ago. It is Elizabeth Bishop's "Crusoe in England." pity I felt the more I felt at home. which is the bliss..."the bliss of what? --Pretty to watch; he had a pretty body. 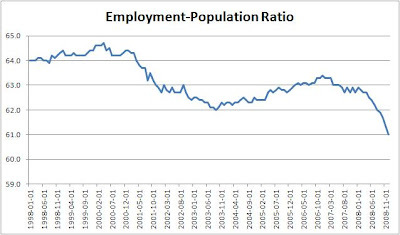 I see that his blog Mankiw shows a chart of the employment population ratio to make a comment about the "so called recovery". But he selected the start date of the chart so that you could not see that during the eight years of the Bush administration the employment-population fell from 63.0 to 60.3, a 2.7 drop. Since Obama took office the employment-population fell from 60.3 to 58.6, a 1.7 drop. The ratio has done poorly under both administrations, but people who live in glass houses should be careful about throwing rocks. 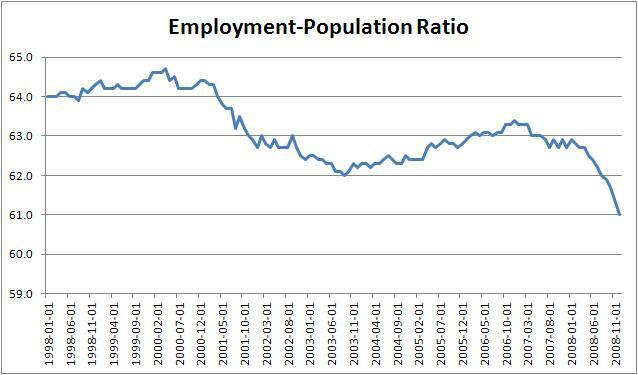 Our graph of the employment to population ratio goes from January 1998 to December 2008. It actually shows that the employment to population ratio when Bush took office was 64.4%. Of course we had a recession right after that followed by a recovery that managed to get this ratio back to 63.4% before the Great Recession that started in December 2007 leading to a collapse in the employment to population. Neither economic growth nor employment did all that well during Bush’s Presidency and yet the usual suspects are hanging out at the Bush Institute lecturing to us about how their policies might someday magically lead to 4% long-term growth. But let’s be honest – this is an awfully slow recovery. 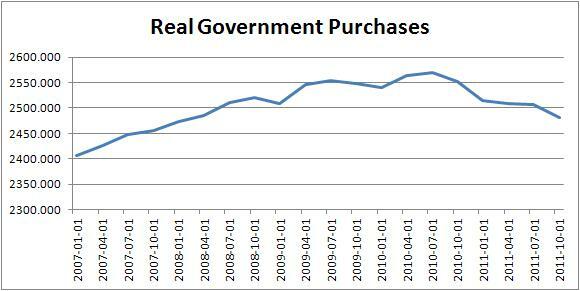 I would argue the reason for this is a lack of fiscal stimulus as demonstrated in our first graph showing real government purchases. Of course, Team Republican wants us to believe that we have too much government spending. I wish one of the actual economists on Team Republican would be candid enough to admit that days after Barack Obama was elected President he called for a much more vigorous stimulus policy only to find that Mitch McConnell would choose to filibuster this proposal to death. Then again – such honesty would get one kicked off Team Republican.